‘When I first saw Karin Kortenhorst’s headpieces, I was attracted to their scale, volume and form. 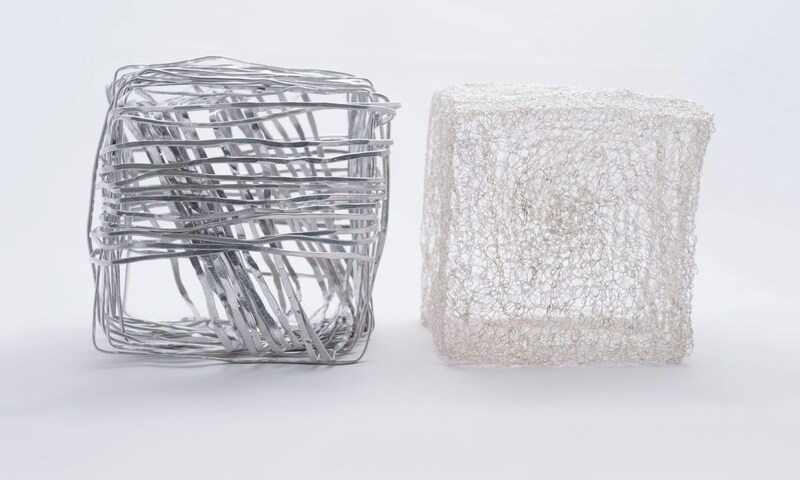 They appear large and heavy but are actually light, fragile and transparent’ said Errico Cassar, Head of the Jewellery Design Department at the University of Stellenbosch. Kortenhorst allows herself to be surprised by what the materials can offer and how this directs her thematic explorations, mostly…always dealing with the human body. Through her work, she investigates status, hierarchy, openness and vulnerability. In conversation, she refers to her work by mentioning the paradoxes that fascinate her. She talks about ‘hero and anti-hero’, ‘contact and distance’, about the ‘crown which gives power and protection, but at the same time creates distance’. Kortenhorst’s drive is her passion for discovery, and discovering new materials is a celebration in itself. She recalls her discovery of coloured telephone wire – ‘I almost fell off my bike as I saw the beautiful colourful bundles of wire bursting out of the ground’. Around her, she adds, the rush hour continued. Nobody shared the beauty of her discovery. This fascination with these materials becomes a starting point for the objects she makes. Some simply grow out of experiments with materials – ‘Forms develop that never cease to amaze me’, she says.